"I DID NOT KNOW, THEREFORE, I AM NOT RESPONSIBLE"
Today, we have witnessed another catastrophy at the ICTY where Serb Col. Vidoje Blagojevic won acquittal on his earlier complicity in genocide conviction. Vidoje Blagojevic who, by the way, happens to facially resemble Adolf Hitler (see photo), seemed unmoved. 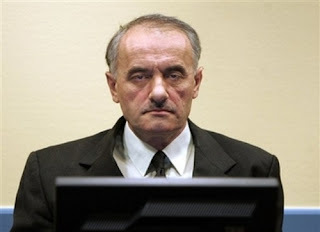 Neverthless, in January 2005, the ICTY handed down the second Srebrenica Genocide judgment finding Col. Vidoje Blagojevic guilty of complicity in genocide committed after the fall of the UN protected enclave in July 1995; the U.N. sentenced him to 18 years of imprisonment. But today, the Tribunal's appeals chamber had a change of heart and concluded that Col. Blagojevic, former commander of Bratunac Brigade of Republika Srpska Army, supposedly did not know about the mass murders taking place and "was only providing logistical support". Our initial response to this judgment was: "Yeah, right. Another insult to human intelligence. How much insult can a reasonable human being really take?" As concluded by the chamber, this means that Col. Blagojevic "did not share the intention to commit genocide," stated chairman Judge Fausto Pocar (Italian). If we could go all the way back to 1991, it would be beneficial to let Judge Fausto Pocar spend years in the enclave under siege, and experience (the first hand) how it felt to be subjected to Col. Blagojevic's terror; not to mention widespread starvation and lack of medical necessities. Maybe only then, Judge Fausto Pocar would have clearer picture of genocidal sufering that Col. Blagojevic's forces subjected citizens of Srebrenica to. Only a naive fool can believe that Col. Blagojevic did not know about Genocide when his forces were committing it. In fact, original judges agreed he was responsible for complicity in genocide; however, Judge Fausto Pocar disagreed. It would be interesting to know true leanings of Judge Fausto Pocar - is he objective (as any judge should be), or does he takes sides? Clearly, original judges saw the case in a different light. Sadly, victims of genocide and their traumatized families will never be able to reverse events of 7/11 1995. At that time, armed forces of Serb Gen. Ratko Mladic and the Bosnian Serb war-time leader Radovan Karadzic, rounded up over 8,000 Srebrenica Bosniaks (includings hundreds of children), summarily killed them, threw them in mass graves, later reburied them in different locations to hide the crime, and forcefully expelled thousands of other Bosniaks from their homes. There will be no appeal for victim's lives; however, war criminals will continue to have "second chances" with respect to technicalities of appeals and endless liberal philosophies. Another Judge, Mohamed Shahabuddeen (Guyana), dissented on several grounds with Judge Fausto Pocar's errors in logic. Some of dissenting arguments were in favor of Col. Blagojevic's appeal, and some against - most notably on the ground to reverse Col. Blagojevic's original conviction for complicity in genocide. By the same decision, the chamber has supported the earlier verdict against Dragan Jokic - former chief of engineers of Zvornik Brigade, Republika Srpska Army - sentencing him to nine years' imprisonment. While it is extremely hard to prove genocide (almost impossible), once convicted - it is much easier to manipulate the system and get an acquittal, as evidenced in the case of Blagojevic. It seems that Judges are receptive to cheap defence arguments that people "did not know" or "did not intend" to commit genocide. So, according to the indictment against the two, Col. Blagojevic's troops were involved in separation of men and women and their taking away in buses after the Army of Republika Srpska had entered Srebrenica. Jokic organised the machinery and forces needed for the digging of mass graves of more than 8,000 people killed in Srebrenica. It seem in this world of 'insecurity', ironically only weapons of mass destruction may provide some security and guarantee of survival for those in danger - as the UN has proved to be totaly incapable to save those who can't save themselves. For example, we witness genocide in Darfur unfolding every day while the UN fails to do anything to protect those poor people from barbarianism initiated by the Sudanese Arab-controlled government. The UN even avoids calling events in Darfur genocide, classifying it as a "massacre." No wonder Israel does not have much confidence in the United Nations. Those who tirelessly criticize Israel's nuclear weapons can't seemingly understand that this small state absolutely needs it to protect itself from total destruction. In a world where small nations can't rely on the United Nations' protection, it is obvious that the rule of force is the only rule that guarantees survival. Based on the allegations in the indictment, the prosecution had requested a sentence of 15 to 20 years for Jokic and 32 years for Blagojevic. The appeals judges, led by Judge Fausto Pocar, upheld Blagojevic's other convictions for aiding and abetting murder, persecutions on political and racial grounds and inhumane acts. They also upheld the murder, extermination and persecution on racial grounds convictions of Dragan Jokic, 49, a major in the Bosnian Serb army's Zvornik brigade. Both men were acquitted of allegations of command responsibility. The court said the men had merely passed on orders, rather than given them. Basically, anybody can use this argument as a defence - even Gen Ratko Mladic (if he ever gets caught). He could simply claim that he was passing orders from Radovan Karadzic or even late Slobodan Milosevic, and wash his hands from any responsibility. Therefore, the Blagojevic's verdict is a total insult to any reasonable person's intelligence. It seems that - after all - crime pays, given the fact of ridicolous lengths of sentences that were handed down to most (if not all) ICTY convicts for mass killings, rapes, persecutions, crimes against humanity, even genocide. The Appeals Chamber stated that "no reasonable trier of fact could find beyond reasonable doubt that, without knowledge of the mass killings, Mr. Blagojevic's awareness of the other facts related to the forcible transfer operation shows that he had knowledge of the principal perpetrators' genocidal intent". With respect to the "principal perpetrator's genocidal intent", the Judge was clearly refering to the indicted architects of the massacre, Bosnian Serb leader Radovan Karadzic and his wartime military chief Gen. Ratko Mladic, both on the run, more than a decade after being indicted for genocide. There is a little or no hope they will ever be caught, as they are regarded as "holy" and "heroes" of mythical proportions among general Serb population. So far, The ICTY has passed legally binding verdicts against six people indicted for Srebrenica genocide and crimes committed in Srebrenica since 1993, including the verdict for genocide against General Radislav Krstic, former commander of Drina Corps of the Bosnian Serb Army. The International Court of Justice also passed a verdict recognizing Srebrenica massacre as genocide in a case of Bosnia vs. Serbia. Additionally, trials against seven more Srebrenica indictees are ongoing, and three are still to start. Other trials are ongoing in Bosnia-Herzegovina.